Two light switch mode: Monochrome mode (white color) and gradual color-changing mode. 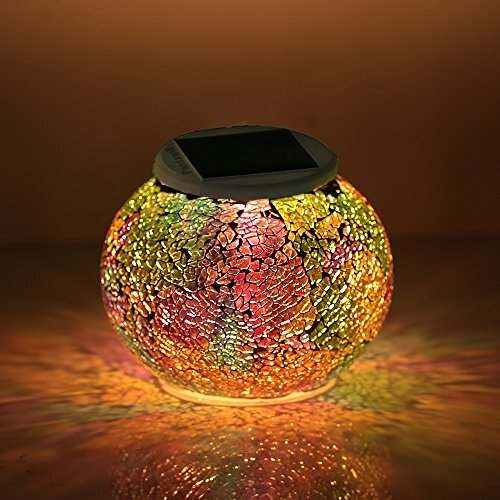 GoerTek solar table light: Made by colorful mosaic glasses, have a beautiful decoration. You can also place small tools like pen or scissor etc. High technology solar panel: Supported with powerful solar panel and built-in rechargeable Ni-MH battery. The solar table light can light up about 8 to 10 hours after getting fully charged. Easy to operate: One button with three gears, auto on at night, auto off at sunrise. Waterproof/Weatherproof: function well even if in the rainy days. Automatically turns on at dusk and off at dawn.